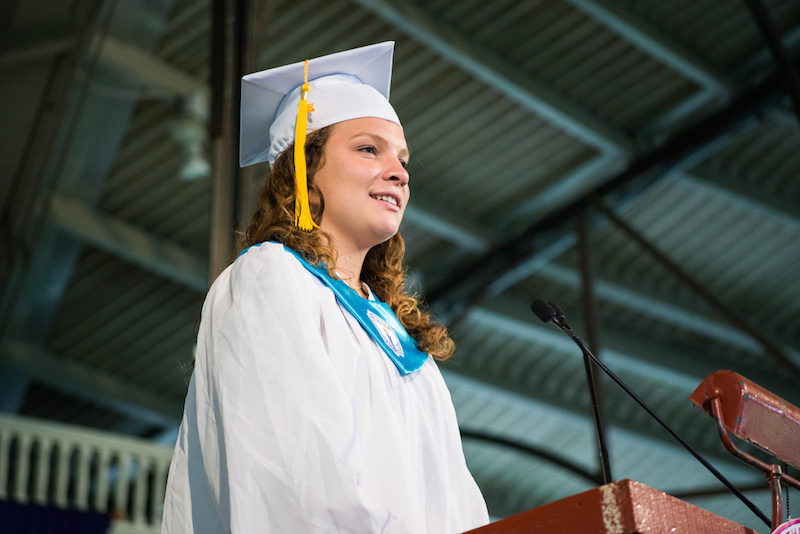 Rose Engler, valedictorian of the regional high school's class of 2018. Rose Engler is the valedictorian of the regional high school class of 2018. She gave this speech at Sunday's graduation ceremony. I run. Running is hard. A mental challenge and a physical feat. It does not matter how far you go — 10 meters, 10 miles. Running is hard. I blink, opening my eyes to a familiar dirt path. I stare intently at the winding dust, never lifting my gaze from the earth. I have memorized every dent, pebble, and stone throughout our forest in an effort to protect myself from a potential fall, a potential fail. Two years, three seasons, 720 miles of dust, of dirt, of grit. In those 720 miles, I had never lifted my eyes, for if I did, I would be left unprotected, at risk of falling, of failing; no trust in those before me or after me to catch my fall, only trust in myself. One day, I was on a routine long run with a friend, Yayla. Predictably, I was staring at the ground, grinding, excited to finish. I was tired. I was hot. I was running fast so that I could finish soon. “Rose, if you don’t want to run, stop,”​ ​said Yayla. I stopped. I blinked, opening my world to a thick canopy of evergreens and hundreds of purple wildflowers licking the edges of the winding trail. I was looking up. At last. Suddenly I realized that in my obsession to avoid falling, I had never really gotten off the ground. So now I tell you, and you, and you. Stop. Blink. ​Look up. Smell it, taste it, feel it. Take it all in, but ​never ​squander your limited time or your precious energy. Find what you love, and love what you find. If you get lost, stop. Stop and look up. This is your run and you’re surrounded by purple wildflowers. ​Jake Sequoia Baird. ​Our ​calamity. Denial. Impossible. You were just picking him up from Cumbies, iced coffee in hand. Anger. Punch. Throw. Cry. Fists crash on bathroom white tile floors. Nobody deserves this. Bargaining. God. Devil. Mom. Dad. Please. Depression. Empty. Acceptance. Living in a world where he is missing. Permanence. Truth. Denial, anger, bargaining, anger denial, acceptance, depression, denial. Kubler-Ross says there are five stages of grief, starting with denial and moving to acceptance. To hell with Kubler-Ross. There is no order. There are no perfect stages. I’m not even sure if there is a beginning or an end. Jake died at 17, but he will continue to run through each and every one of us. Stop. Blink. Look up. We run on. I dance with the brush strokes of Monet, debate with Phaedrus and Socrates over the concept of love, and cry for the mind of Mozart. I chase derivatives, swim with lysosomes, and wrestle with code. I ​love​ to learn. Emily Hewson ​surfs the vibrations of her vocal cords through the wormholes of time to be released amidst the dust of stars. She crescendos to dance along a note’s derivative, and falls from forte to piano to be dropped from the fingertips of Galileo. She​ loves​ to sing. Opal Wortmann spilled the contents of her heart onto the guidance department’s walls — particles of color designated emotions. Awaiting advice, her mural becomes our guide. She ​loves​ to paint. Olin Gannon and Salyn Yancy beat life into dirt, carefully crafting their vivid imaginations from particles of ground up sand. Muck sprouts into figures, clothed by glaze. They​ love ​ceramics. Medicine is ever-changing. Every day brings new patients with new illnesses requiring new treatments. It calls for innovative thinking, and a type of uncommon bravery as one needs to continuously evolve. Kiana Casey will explore the ailments of different patients and minds of different doctors. She ​loves​ physical therapy. Computer science is the construction of reality from dreams, where a vibrant app or a foggy innovation can be captured and relayed. ​Jeff Bezos has replaced Santa Claus, and Seattle the North Pole. We can’t make it to our local barbershops without Google Maps or discuss feelings without emojis. Technology is changing our world, and Kat Roberts wants to be standing in the front. She​ loves ​computers. Gabe Nelson pawned his textbooks from Falmouth Academy to start his own brand, ChessClub Clothing Company (readily available at the Green Room and online). Get it? Pawn? Chess? My boy David Schweitzer is constructing a suit of armor from metal feathers, and Otto Osmers is raising kelp in his quest to provide sustainable nourishment. Passion is being discovered all around us. If you found it, don’t let it go. And if you haven’t: stop, blink, look up. Four years, four seasons, 1,460 miles of life. We won’t look back down. ​We run for the journey. Every step we take, we do so consciously, blissfully aware.​ And if we want to stop, we stop; we lay down in the grass, and we stop. Blink. Look up. And grab your roots. Blueberries in August, Daffodils in May. An Island our home. We wander fishing poles in hand, property lines become nonexistent, deserted mansions become our playground. Searching, searching, for secret sandy spots, waves untouched by publicity. We name them, they become ours. Friday nights are community potlucks, their setting a barn, fairy lights and carrots. Saturday nights are bonfires. Nights turn into mornings, omelettes and raspberries. Tuesday nights are swims, luna reflects off the cold liquid, naked bodies run rampant, naked mouths sing. Whispers in August, shouts in June, an Island our home. Forever our home. Congratulations Martha’s Vineyard Regional High School Class of 2018. You did it! You made it through MVRHS, a place of bathroom passes, inspirations from Wade, and seemingly endless figure eights. But the best is yet to come. Equipped with the past and ​engrossed ​in the present, you can shape your future. Today is the first day of the rest of your lives. Don’t miss it. Look up. Wow! I'm so glad I stopped (Get it? Stopped.) to read this. What beautiful writing. What clarity. Can't wait to hear what worlds you are conquering next, Rose Engler. You are ready. You’re good. You will do well in the new world ahead. Congratulations.